Corsair's new PC cases revealed at CES 2016 cater to enthusiasts of all sorts. That holiday feeling may still be lingering in your bones, but at CES 2016 in Las Vegas, thousands of companies are already honing in on the products you’ll be buying next. 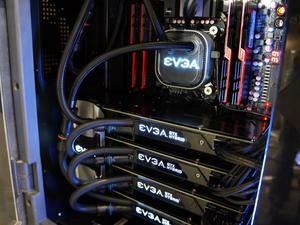 Case in point: PC hardware peddler Corsair, which just revealed not one, not two, but three new computer cases, each with its own unique appeal for PC enthusiasts. 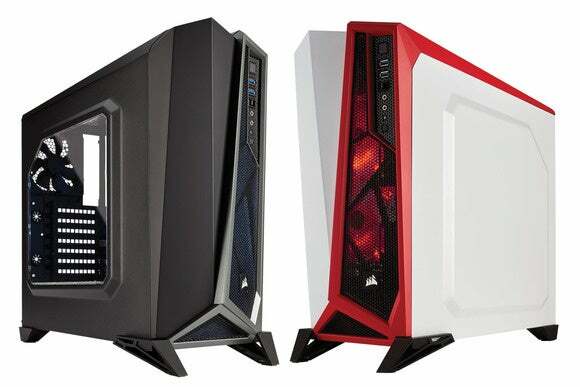 Corsair’s Carbide series Spec-Alpha mid-tower case (pictured above) captures the eye most vividly, bristling with sharp angles, a clear window to show off all your gear, and a vibrant red hue. (It’s also available in black if you lean towards more mild aesthetics.) The Spec-Alpha packs a trio of LED-equipped 120m fans controlled by a three-speed controller on the case’s exterior, while Corsair has ditched support for a traditional 5.25-inch optical drive, which frees up a straight path from the front fans through the case and over the CPU and GPU—a setup the company dubs “Direct Airflow Path.” If liquid-cooling is more your thing, the front of the case is compatible with 240mm radiators. The Spec-Alpha includes other goodies you’d expect to find in a decent gaming case, such as USB 3.0 support, space for up to four SSDs with tool-free installation, and cable routing and tiedowns behind the motherboard tray to keep your case interior nice and clean. If you’re going to have a case window, you want your PC looking good, after all. The Spec-Alpha will land in March for $80. 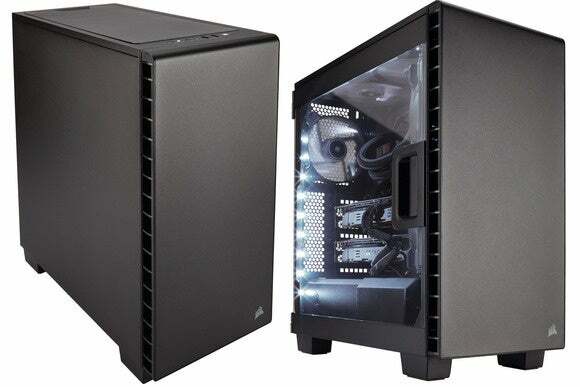 The other two compact mid-tower cases Corsair unveiled at CES are available now for $100. The Corsair Carbide Quiet 400Q and Carbide Clear 400C are almost mirror images of each other, with both designed in line with Corsair’s traditional black steel box styling, but each sports a unique tweak of its own to appeal to particular niches. Corsair’s Carbide Quiet 400Q (left) and Clear 400C (right). The Carbide Quiet 400Q focuses on keeping acoustics as low as possible, featuring a closed design and an interior lined with sound-dampening materials. The Carbide Clear 400C takes a flashier approach, slapping a clear window on the left side of the case to show off all your components (but keeping the sound-dampening materials on the other surfaces). Consider it the more restrained cousin of the Spec-Alpha. These cases offer more cooling versatility than the flashier Spec-Alpha, with support for a 360mm radiator in front, a 240mm radiator up top, and a 120mm radiator at the rear of the case. Out of the box, the Carbide Quiet 400Q and Carbide Clear 400C pack 120mm intake and outtake fans at the front and rear, along with dust filters and the same “Direct Airflow Path” design as the Spec-Alpha. Both cases are equipped with features to keep your build as clean and hassle-free as possible, such as tool-free drive installation, cable cutouts and tieoffs, side panel access, and modular covers for both the 3.5-inch drive bays and the power supply. We’ll be checking Corsair’s new cases out firsthand at CES 2016 later this week, along with the Bulldog 4K system the company first revealed at last year’s CES. Stay tuned!